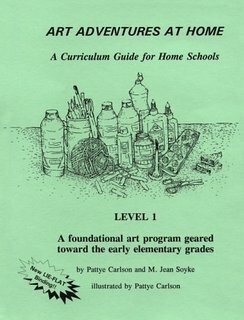 On this page are various art curricula that span all grades. Sharpen your pencils and get ready to learn from the best! The Painter of Light himself teaches your budding artist the basics of realistic drawing, including line, shape, form, tone, space, and texture. His fun, skill-building exercises will help you learn to observe and re-create the world around you. For ages 8 to 12. Features five lessons on DVD, plus five student workbooks. I recently purchased this book to see what it was like. Art Adventures at Home Level 1 is for grades K-2. Objectives are listed on page 9 and each one is paired with a "key". The previously mentioned "key" is used in each lesson plan at the "Big Idea". The lessons are divided into three years-- Year A, B, and C.
Each "Year" includes 35 lessons, making 105 lessons in the entire book. Lesson planning for this book is already done. Your job will be to schedule the lessons. I (also) recently purchased this book to see what it was like. Level 2 is laid out in the same way as Level 1, so please read my comments for Level 1. 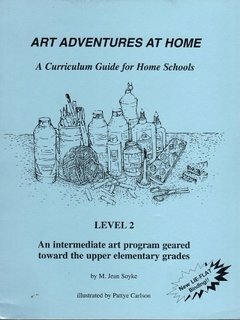 Art Adventures at Home, Level 2 is for grades 3-5. I ordered this book, but the order was canceled by the seller- apparently it was out of stock. I cannot say what this book is like. Art historian Sister Wendy Beckett once said, "Looking at art is one way of listening to God." As your children journey through this 5-year curriculum, they're sure to hear God's voice along the way. More than 250 lessons blend art history with hands-on instruction in drawing and painting---and feature illustrations by homeschoolers. Includes 35 paint cards. Ages 10 and up. 454 reproducible pages, softcover. Includes teacher's book and volume one and two. This delightful introduction to art for ages 8 to 13 covers color theory, drawing, anatomy, perspective, nature studies, portraits, cartooning, lettering, creative writing, and more in a one year curriculum. Lessons can be done directly in the book, which includes a sketchbook in back of the text. This conversational drawing-book combines casual text, simple lessons and quotes for the great artists for a fantastic introduction to drawing. Starting with the basics--"Draw lines, young man, draw lines!" --and incrementally growing towards the advanced--copying the masters and creating portait studies--students will learn about the steps it takes in order to become a truly good artist, as well as those who've already achieved such a distinction. Illustrations at each step of the way provide visual examples of the textual instructions. 116 pages, softcover with a blank "Sketchbook" included in the back. Five pen & ink cards are also included. Ages 13 & up. Supplies that are recommended to be purchased separately include: a drawing pencil set, an ultra fine black pen, calligraphy pen, pencil sharpener & a kneaded eraser. This conversational drawing-book combines casual text, simple lessons, scripture and artist quotations in a fantastic continuation of drawing instruction. Designed to follow How Great Thou Art Volume 1, this book can nevertheless be done as a separate course, as some of the lessons from the first will be reviewed. Starting with basics of ellipses and lines, students will discover how to draw anatomy, nature, still lifes, lettering, automobiles and various other interesting drawing studies. Illustrations at each step of the way provide visual examples of the instructions. 113 pages, softcover with a blank "Sketchbook" included in the back. Ages 13 & up; 85 lessons. Four pen and ink cards are also included.